Little Town on the Prairie, the 7th book of the Little House series by Laura Ingalls Wilder, takes place throughout Laura’s early teen years. The stories detail a more prosperous time for the Ingalls family as the girls are quickly maturing and active in school and social events. Changes for the family are abundant as they move back and forth between living in the shanty house on the claim throughout the warmer months and returning to stay in town during the winter. Mary moves away to go to college, and the town continues to become increasingly populated. Laura’s life takes on more grown-up themes as she works at her first job as a seamstress, receives her first calls from a young man, and eventually achieves her teacher’s certificate, and yet she is still the same spunky girl who enjoys playing outdoors and continues to detest Nellie Oleson. Pros: It is a relief to finally see this hard-working family gaining in prosperity and settling into life comfortably. This book innocently teaches lessons in proper decorum, living with meekness, avoiding jealousy, and loving with generosity. Cons: I did find that some parts of the story were a bit difficult for my children to understand and they could not related to Laura as well as they had in previous books. For example, when Almanzoasks if he can walk Laura home, my children were just as oblivious as Laura was to the meaning of this request! By the end of this, the 6th book in the Little House series, the reader truly feels the length of The Long Winter and the gravity of the situation for the Ingalls family. 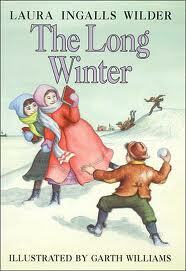 While I enjoyed the reading of this book, I was ready for the winter to end. The monotony of their days, the overwhelming cold lasting for over six months, and the hunger pangs they all experienced made me feel overwhelmed, tired, and glad that I was reading this book in the middle of a very hot summer. I simply cannot adequately imagine trying to heat a house with only hay for months on end in sub-zero temperatures with little insulation or use of modern conveniences. I have never been so hungry as the Ingalls family was that winter, and cannot fathom eating coarse bread for every meal. I have never been even remotely concerned that my family may starve or freeze to death. This book made me realize my blessings in having plenty of food, a comfortable home, and modern conveniences. Pros: A great book to teach children that not everyone has food, heat, and other things they consider necessities in life. Cons: This book seems to drag on forever, just like that terrible winter did for the Ingalls family. Summary: Little House in the Big Woods, the first book in the Little House series by Laura Ingalls Wilder, sets the stage for many hours of captivating reading. I suggest going ahead and reading this book to young children, as they can easily bond with the characters who are also very young in this book. Meeting Jack the dog, Charlotte the rag doll, Ma, Pa, Mary, Laura, and Carrie will seem real and home-like. You and your audience will almost be able to taste the Christmas candy, feel the cold wind on your cheeks, see the big “bear,” and hear the sleigh bells ring. The occasional illustrations by Garth Williams allow the young reader to gain a visual perspective of the story in an elegant, yet simple form. Pros: A great way to start young children on longer chapter books. Exciting stories that children can relate to, as well as simple illustrations to help them visualize what they are hearing. Cons: This book is a true classic – no complaints for me. Farmer Boy by Laura Ingalls Wilder has recently become one of my favorite books of all time. My mom read this book to me years ago, but I certainly did not appreciate it then as much as I do now. It is amazing how much “life experience” can change your perspective. This book follows childhood story of Laura’s husband, Almonzo, as he grew up in New York state. Stories about farm life, school, and church teach about life in the late 1800’s yet are remarkably applicable to children’s lives today. Character lessons in Farmer Boy include perserverence, patience, hard work, humility, kindness, and so many more. My girls were riveted to the story every time we picked up the book and I could hardly put the book down. I would recommend this book to anyone to read aloud or to themselves.